Congratulations to Prairieville resident Catherine Cazes! 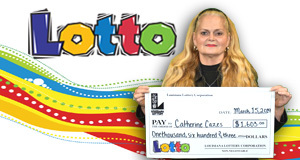 Catherine recently won $1,603 during the Feb. 27 Lotto drawing. "I thought 'Ooo this is good!" the winner recalled. She was at the latter end of a trip, bringing a friend to the hospital when her passenger asked to stop at Circle K #9726 on Drusilla Lane. "I only bought one ticket and it was a winner!" Catherine explained. The winner plans to give half of her new dough to her husband and use the other half to take her granddaughter on a vacation!